Waterbury No. 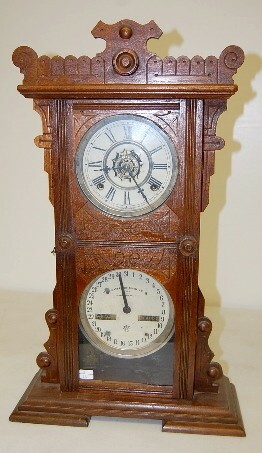 44 Double Dial Calendar Clock 8 day time, hour and half hour strike with alarm; has key and pendulum; 5" marked tin painted dials. (Dials crazed; chips to lower dial; wear to case; could not wind.) 23 3/4"